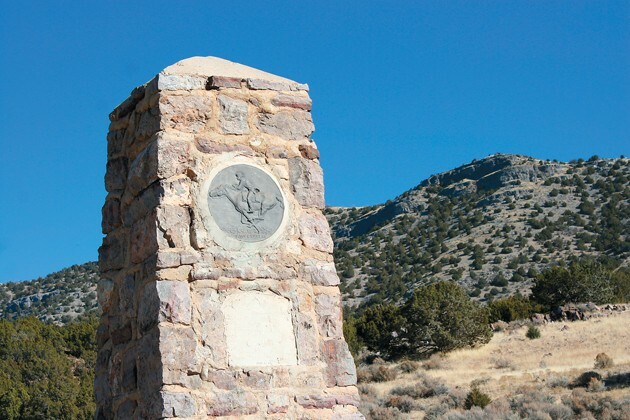 The Pony Express Trail west of Lookout Pass to the Utah border and beyond was known as “Piute Hell” back in 1860. 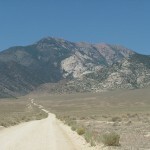 According to authors Fike & Headley, who made an in-depth study of the station sites in Western Utah in 1976, the trail across Tooele County’s West Desert was shut down for several months because of conflict. Marauding American Indians attacked riders, burned stations and killed 16 whites in the process. The Indians were no doubt upset about the intrusion of their ancestral lands that the Pony Express Trail, the Overland Stage and emigrants represented. Upon reaching the bottom of the first descent from Lookout Pass, you will arrive at an old stone marker where Lookout Station purportedly existed. Many famous travelers along the Pony Express Trail, who kept detailed journals of their travels, make no mention of a station there. This, however, can be explained by a statement made by Frederick Hurst, who was employed by Major Howard Egan. “In April 1860, Egan built a Pony Express Station there so horses could be exchanged after the steep grades of Lookout Pass … by September the station was in ruins,” stated Hurst. The timelines in this statement are supported by the devastation suffered by company property during the 1860 Piute War. This little flat, which is surrounded by hills of the Onaqui Mountains, is full of stories and history. 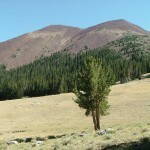 In his journal, Egan stated that the station was known as “Jackson’s Station.” There were many pioneers and explorers who traveled over this pass, like Doc Faust, Peg Leg Davis, Enos Stookey, troops from Camp Floyd charging after desperados and Indians, Concord Stage coaches heading west to California, and Pony Express Trail riders spurring their mounts to escape Indian ambush. One story that must be retold each time Lookout Station is discussed is the tale of Aunt Libby Rockwell and her dogs. Libby was married to Horace Rockwell, who was the brother of Danite Chief Orrin Porter Rockwell. Porter Rockwell used to raise horses on his ranch, which was located along Government Creek in between the Simpson and Sheeprock ranges. In 1870 the horse ranch headquarters were moved from that place to the old “Lookout Station” along the Pony Express Trail. Horace and Libby moved into the old station house and lived there for many years. The following tale concerning Libby comes from the writings of Dr. William Stookey of Clover. Stookey described the Rockwells as Mormons, but he also stated that they were rough frontier folk. Libby smoked a pipe regularly and probably chewed tobacco as well. The Rockwells didn’t have any children, but they did have dogs. Libby loved her dogs more than a lot of parents love their own children. The dogs were described as being “low, fat, short-haired black dogs with tan legs.” Stookey stated that the dogs were always overweight. In fact, one of the men who worked at the station, a Mr. Perkins, complained that the dogs ate better than him. Libby named one of her dogs Josephine Bonaparte after the empress of France and wife of Napoleon Bonaparte. She named another one of her dogs Jenny Lind after the Swedish singer, who had such a beautiful voice and good range in the 1850s that she was known as the Swedish Nightingale. Another dog was named Toby Tyler after the popular children’s classic of the late 1800s. The last dog that I am aware of was named Bishop. When her dogs would get sick, Libby called on Tooele physician Dr. Dods and begged him to come out, even going so far as to offer him $20 gold pieces to do it. 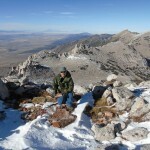 Dods complained that he had more human patients than he knew what to do with and that he would not come out to Lookout Pass to check on dogs. This frustrated Libby, so she decided to outsmart Dods. Libby said to her hired man, Elijah Perkins, “Lije, I want you to play sick so Doc Dods will think a human is sick and not an animal, and that way he will come a runnin’.” Libby was right — Dods showed up hours later asking for to see the patient. He became angry when he discovered that Lije wasn’t sick and it had been a ploy to get him to Lookout Pass to treat the dogs. Libby paid him $100 in gold coin for his trouble. Dods begrudgingly agreed to look at the animals on account that he was there. This was no small sum of money in the 1800s, but Libby loved her dogs and when their well-being was concerned, money was not a factor. This trick didn’t work again and Libby was forced to take her dogs into Salt Lake City for treatment. On one such occasion, old Toby Tyler died on the road. Libby was heartbroken by her loss and she had Gustave E. Johnson erect a stonewall around a small cemetery in 1888, where she laid her beloved dog to rest. As the years went by and her dogs passed away, Libby lovingly buried her dogs in the little pet cemetery. 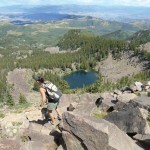 When the last dog died, Libby and her husband moved away from Lookout Station. This was approximately 1890. Libby died in Los Angeles in 1895 when she burned to death in her bed. It was said that she had been smoking her pipe when she fell asleep and everything caught on fire. If you visit the site of Lookout Station today, notice the small rise of ground behind the rock marker that was built by the boys of the Civilian Conservation Corps in 1939. This is likely the station site. Next, turn around and look south across the small valley at the base of the hill and you will see Aunt Libby’s Pet Cemetery. Years ago it was obscured by junipers, but a few years back, a range fire burned all the trees around and now the cemetery is plainly visible. The small green flat between the station marker and the pet cemetery makes an excellent place to camp. Captain James H. Simpson thought so as his exploring expedition camped here in May 1859. The night sky is amazing here, and when the sun goes down, the sound of crickets, nightbirds and an occasional hoot owl make this a great place to re-tell the stories of the Pony Express and Aunt Libby’s dogs over the campfire.